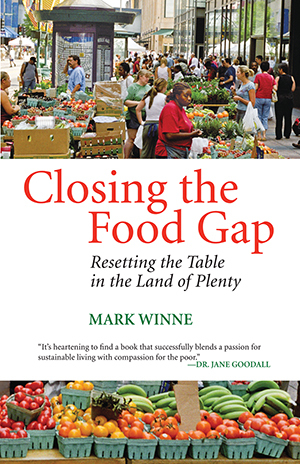 In Closing the Food Gap, food activist and journalist Mark Winne poses questions too often overlooked in our current conversations around food: What about those people who are not financially able to make conscientious choices about where and how to get food? And in a time of rising rates of both diabetes and obesity, what can we do to make healthier foods available for everyone? To address these questions, Winne tells the story of how America’s food gap has widened since the 1960s, when domestic poverty was “rediscovered,” and how communities have responded with a slew of strategies and methods to narrow the gap, including community gardens, food banks, and farmers’ markets. The story, however, is not only about hunger in the land of plenty and the organized efforts to reduce it; it is also about doing that work against a backdrop of ever-growing American food affluence and gastronomical expectations. With the popularity of Whole Foods and increasingly common community-supported agriculture (CSA), wherein subscribers pay a farm so they can have fresh produce regularly, the demand for fresh food is rising in one population as fast as rates of obesity and diabetes are rising in another. Over the last three decades, Winne has found a way to connect impoverished communities experiencing these health problems with the benefits of CSAs and farmers’ markets; in Closing the Food Gap, he explains how he came to his conclusions. With tragically comic stories from his many years running a model food organization, the Hartford Food System in Connecticut, alongside fascinating profiles of activists and organizations in communities across the country, Winne addresses head-on the struggles to improve food access for all of us, regardless of income level. Using anecdotal evidence and a smart look at both local and national policies, Winne offers a realistic vision for getting locally produced, healthy food onto everyone’s table. To enter the parking lot of any Hartford, Connecticut, supermarket in 1979 required a sharp, reckless turn into a poorly marked curb cut. If you came at it too fast to avoid a collision with the suicidal driver heading right at you, you would bottom out your car’s undercarriage on the lot’s steeply graded entrance. Once in the lot, Hollywood car-chase skills were essential to maneuver across a parking area that was strewn with broken glass, overturned shopping carts, and potholes deep enough to conceal a bushel basket. Since the white lines marking parking spaces were faded or nonexistent, you left your car wherever it suited you. Once you got inside the store, the first thing you noticed was the smell. It wasn’t so much that “something has died” odor, but more the scent of something that rotted and was never fully cleaned up. When seasoned with a pinch of filth, marinated in gallons of heavily chlorinated disinfectant, and allowed to ferment over many years, the store released a heady aroma that brought tears to the eyes of men stronger than I.
Crunchy sounds emanated from the floor as your shoes crushed imperceptible bits of grit and unswept residue whose origins had long since been forgotten. The black and white floor tiles were discolored, unwaxed, and marred at irregular intervals by jagged brown stains that were forever one with the tiles. Granted, these were pre-Whole Foods Market days. The supermarket industry did not yet have the technology that gives today’s stores the soft, warm glow of a tastefully decorated living room. Instead, the humming neon bulbs, shielded by yellowed plastic coverings, cast a sickly pallor over the shoppers, the staff, and, worst of all, the food. The iceberg lettuce, already suffering from a 3,000-mile journey by truck, looked like the victims of a mass beheading. The rest of the produce case, from mushy apples to brown bananas, displayed a similar lack of life. A stroll down the meat aisle was as appealing as a slaughterhouse tour at the end of a busy day. Small pools of blood that had leaked from hamburger and chicken packages dotted the surfaces of the white enamel meat cases, the blood at times indistinguishable from the rust that discolored the chipped veneer. The atmosphere did not encourage a leisurely appreciation of food, nor did you feel like engaging in more intimate acts of product selection such as touching, squeezing, or sniffing. The fear of prolonging the unpleasantness made “grab and go” the prevailing modus operandi. It didn’t take too many trips to this sort of market before I was suffciently motivated to go to a suburban grocery store. I was lucky; I owned a working automobile. Up to 60 percent of the residents in Hartford’s lowincome neighborhoods did not. Nor, as I would find out later, did the city’s public transportation routes go to the suburban supermarkets. My journey to the nearest full-size chain supermarket was six miles roundtrip. The store had easy vehicular access and a large, wellmaintained parking lot, as well as shiny, clean aisles, floors, and food cases. The floor space available for product display was at least twice that of the largest remaining Hartford store, and the products were pleasantly arrayed. The produce section, though not brimming with abundance by today’s standards, was quite ample and free of wilt, anemia, and other symptoms of imminent death. The store’s staff was reasonably friendly, albeit prone to the lassitude common among those who must do repetitive, low-paying work. At least they would help me locate hard-to-find items; those requests were usually greeted with hostile stares by workers at the city stores. Besides offering a generally more inspiring shopping environment, the suburban store had another point in its favor: it was cheaper. While not every item in the suburban store was priced lower than in the city stores, I soon found that I was probably spending 10 to 15 percent less for my weekly grocery shopping than I had been in Hartford. This proved to be true even for chains that still operated stores in both the city and the suburbs: the suburban unit had lower prices than its city cousin. How could this be? I wondered. The chain bought from the same wholesale suppliers, the stores had roughly the same pay and staffing structures, and they were only a few miles apart. As it turned out, my revelations as a new resident of Hartford elicited not much more than a knowing sigh from colleagues and neighbors. The fact that city stores were inferior to suburban ones was nothing new to them. They had been watching the slow but steady abandonment of the city by supermarkets for ten years. “Yes,” I was told on many occasions during my first year in the city, “the supermarkets have abandoned Hartford, and the poor, who can’t get to the suburbs, pay more.” “Supermarket abandonment” and “the poor pay more” became part of the lexicon of the organization I had come to lead, the Hartford Food System, and for many years to come, this prevailing understanding defined the food gap. I knew little of Hartford prior to my decision to take a job as the executive director of the Hartford Food System in 1979. Trips from my home in New Jersey to attend college in Maine a few years earlier had taken me along newly opened stretches of interstate highway that bypassed the city so efficiently that any thought of a stopover was strongly discouraged. I knew I had crossed a second river that wasn’t the Hudson. The Tappan Zee Bridge’s broad reach left no doubt that you had crossed that renowned waterway. But the highway bridge that led from Hartford to East Hartford over the Connecticut River had been designed to keep the river’s existence a secret. Views of its gentle, tree-lined banks appeared to have been officially denied. After all, road engineers back then were not rewarded for their ability to incorporate natural features into highway designs but for their ability to pave the most territory for the least cost. My first day of work in Hartford brought me into intimate contact with a city that had previously been placed off limits to the casual traveler. A car tour took me down long, wide boulevards intersected by neighborhood side streets that, on that chilly February day, were empty of all human activity except the occasional homeless man drawing life from a brown paper bag. Three-story brick buildings of late-nineteenth-century vintage gave many of the streets a graceful symmetry, although I noticed that several buildings had broken windows or plywood nailed over all the openings. Known as “perfect sixes,” these buildings were evenly divided into six apartment units and were common both just north and just south of the city’s downtown. Crossing over I-84 from Hartford’s Northend, I entered the city’s downtown business district, still a fairly vital place in 1979. It was filled with bustling pedestrian traffic headed to and from corporate office buildings and signature sandstone department stores. The world famous insurance industry was a driving force, with buildings sporting the companies’ tastefully understated logos: the Travelers’ red umbrella, the Hartford’s twelve-point stag (or hart, as in hart ford, the place along the river where the deer crossed), and Aetna’s mountain. Among the many things I would learn about the city’s corporate culture was that Aetna was deferentially referred to as “Mother Aetna” for its oversized nurturing presence. The reality was that these insurance giants not only dominated the cityscape physically but controlled the city’s financial, social, and cultural life as well. Though commanding in their presence, they eschewed the kind of entrepreneurial brashness of today’s Donald Trumps and Steve Jobses in preference for a more button-down, paternalistic ethos befitting their high-toned Yankee origins. After all, they labored under the long-dead but still ironic gaze of Mark Twain, Wallace Stevens, and Harriet Beecher Stowe, who had burnished the city during its golden era. Hartford’s Southend had the feel of Boston’s North End, with an abundance of Italian immigrants and foods and the kind of vibrancy that you wouldn’t expect from the uptown actuarial crowd. Wood-frame houses built in the 1920s lined the streets, some of which were still graced with elegant shade trees, whose generous canopies would later provide a welcome respite from the summer’s heat and humidity. In those months, old men leaning on canes would huddle together on street corners and in cafs holding fast to the customs of Italian village life, minus perhaps the public consumption of grappa. The non-Italian speaker had virtually no hope of finding his way into this closed brotherhood. The older Italian families in the Southend, like the African Americans in the Northend and the Puerto Ricans in between, were now the predominant faces in a city that was moving rapidly from white to brown and black. Hartford’s civil disturbances (aka race riots) of the late 1960s had signaled the demographic ascendance of the city’s black and Hispanic communities and the steady exodus of its remaining white residents. Similarly, the movement of Puerto Ricans into the Southend--they had come to the area in the 1940s and 1950s to pick tobacco--provoked an uneasy reaction among the younger Italian families, whose trickle to the suburbs was becoming a steady stream. The nearby suburbs of Wethersfield, West Hartford, and Bloomfield beckoned. Increasingly, they were viewed as safe havens for Hartford’s middle-class residents, who were growing uneasy with the city’s changing complexion and growing number of lower-income households. Housing prices in the suburbs were still relatively low, the shaded streets were virtually crime-free, and the commuter ride to Hartford’s central business district was comparatively short. Perhaps most important, the suburbs’ public schools were excellent, which is usually one of the important criteria for any young family in selecting a community to live in. What my windshield tour of the city revealed on my first day of work was the early but undeniable signs of a city in decline. It was a place whose natural chemistry had worked tolerably well for a hundred years or more but had been thrown too rapidly out of balance now that circumstances were changing. Middle-class flight, aided in part by America’s car culture and the emergence of the interstate highway system, left behind a giant sucking sound in urban cores across the country. Like the surf crashing against a beach then draining seaward again, middle-class families rode a tide of fear, disorientation, and resentment as they escaped to the suburbs. Sometimes with an undertone of racism and sometimes with an aching kind of liberal guilt, most white families, and later middle-class Hispanic and African American families, left the city when their resources permitted. There was a strong personal dimension to these social and economic circumstances as well. As someone who had moved to Hartford to run a social change organization, I was expected not only to talk the talk but also to walk the walk. The moral burden that I had willingly accepted was that I should live in and be a part of the community that I was there to assist. To commute to Hartford from the suburbs--to be a nine-to-five dogooder-- was frowned upon and in some cases explicitly forbidden. To only participate in social action had a lower status than to be committed to the same. Think ham and eggs: the hen participates, but the pig is committed. Introduction Iíve Come to . . . Shop?